TAIPEI, Taiwan (CNN) -- Former Taiwan President Chen Shui-bian was convicted Friday on corruption and money laundering charges, and was sentenced to life in prison, according to officials at Taipei City Court. 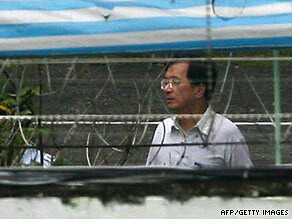 Former Taiwan president Chen Shui-bian walks inside the Taipei Detention Centre in Tucheng on Friday. He was fined 200 million New Taiwan dollars (U.S.$6.1 million) as well. Chen's wife, Wu Shu-chen, who earlier had been convicted of lying to prosecutors, also was convicted on similar charges. She received a life sentence and was fined 300 million New Taiwan dollars (U.S. $9.1 million), according to the Central News Agency, Taiwan's official news agency. The former president was not at the courthouse when the verdict was read. He had asked to be excused and was being held at a detention center. Supporters of Chen gathered outside the courthouse hours before the verdict, wearing bright-green shirts, and carrying yellow balloons and banners. Riot police stood by in case the crowd got out of control as they protested the verdict. The former president's corruption trial began in March. It is the first for a former head of state, and has gripped the island for months. He has denied wrongdoing and has said the charges are politically motivated. Prosecutors say Chen embezzled 600 million New Taiwan dollars (U.S.$17.7 million), took bribes, laundered money and illegally removed classified documents from the president's office. Chen has countered that the bribe money was actually political donations. He has also said that a special presidential fund from which he is accused of embezzling does not clearly say what the money can and cannot be used for. Ahead of Friday's verdict, the island's former first lady was sentenced to a year in prison for lying in her husband's corruption case. Wu was convicted on charges that she helped her son, daughter and son-in-law provide false testimony. Prosecutors said the former first couple's son has a Swiss bank account with $22 million they think are illegal proceeds. The challenge for prosecutors was to prove that Chen handed out political favors in exchange for money. The former president said he was being persecuted politically by his successor. Chen's party favors independence for Taiwan. His successor, President Ma Ying-jeou, favors closer ties with mainland China. Journalist Yin Chen contributed to this report.